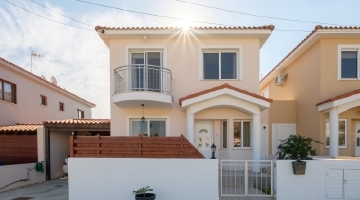 Our latest properties in Cyprus for sale by owner. Open plan and modern design. Secluded garden and pool with great views. 5 minute drive to sandy beaches, boardwalk and beach bars. Basement has a number of uses including business, extra accomodation. 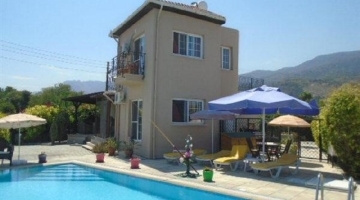 !5 minutes to Limassol town with all amenities. Present owner in the property since new. This bespoke property is designed to enhance Mediterranean living. Internally it is open plan, modern and comfortably laid out. 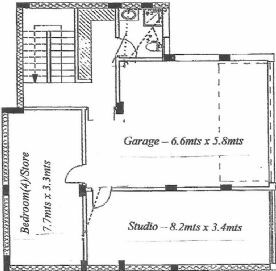 Access to the property is a drive leading to a large double garage and workshop and ample off-road parking. The grounds are landscaped and planted with well-established shrubs and trees. The main entrance leads into an elegant high-ceilinged hall, flooded with bright light from large stairway window. Alongside the entrance is a cloakroom and guest toilet, fully tiled, marble tops and finished to a high standard. The Property offers spacious open plan living on one level with tiled floors throughout and under floor heating. The good size lounge has three sets of sliding patio doors, letting in lots of light and giving access to the wrap around balcony, not forgetting the stunning views over the valley and village. The kitchen is fully fitted with a huge amount of storage units, Granite work surfaces and large island to maximise working space. Two sets of sliding patio doors open onto a deep patio running the full length of the property, allowing for plentiful of shaded areas for seating and dining and with great views. 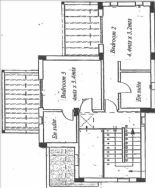 On the same level is the master bedroom, dressing room and ensuite. The large airy double room has sliding patio doors out onto the balcony, fully fitted wardrobes in the spacious dressing room, leading to the ensuite. Fitted to high quality standard and fully tiled. The basement has ceramic tiled flooring throughout, fitted kitchen and shower room, two large reception rooms, one currently being used as office and music room. Could easily be a self -contained annex for family, guests or staff. Alternatively, for work, gym, clinic, etc. The secluded garden has mature planting around the pool and bar creating beautiful shaded areas for relaxing and entertaining. This property boasts a well thought out grounds, much laid to patio, which provide spaces that lend themselves to anything from small gatherings to much larger parties and events. The bar is fully equipped for outside hosting with fridge, sink, gas BBQ and storage cupboards. There is still a large area of land behind and above the property which can be developed and has tremendous views over the valley and village. The Mediterranean weather lends itself to outdoor living. The house benefits from sun for most of the day, with the front facing east for the morning sun, dropping behind the hill in the early evening for cool evenings. The pool, bar, outside dining areas and garden is fully secluded. Within 5-minute drive are many spectacular sandy beaches, a board walk right round the bay and into Limassol town. Limassol itself has many features. Department stores, two marinas and local sailing clubs, many bars and restaurants overlooking the sea, as well as cinemas and theatres. Other activities on the island include walking, gliding, golfing, fishing, etc. The Troodos mountains are the backbone of the island and it is said you can ski in the morning and swim in the afternoon. We have not tried it.